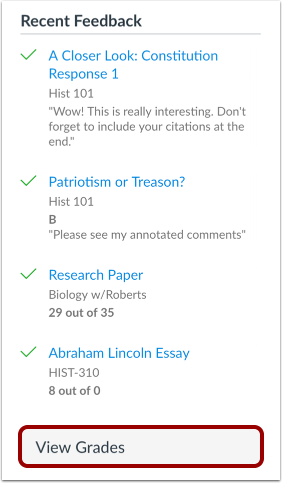 How do I view grades in the Dashboard as a student? Note: You may not be able to view grade totals. The Courses I'm Taking heading displays the name of each course and a current overall grade, if available . If no grades have been assigned, the grade appears as no grade . To view grading details, click the name of the course . Note: Your instructor may restrict you from viewing grade totals. If your course is using multiple grading periods, the course displays the name and grade of the current grading period . To view grades for another grading period, click the grading period drop-down menu . Previous Topic:How do I use the To Do list and sidebar in the Dashboard as a student? Next Topic:How do I view all my Canvas courses as a student? Table of Contents > Global Navigation > How do I view grades in the Dashboard as a student?